I've added a page to the sidebar on the right called "Introduce Yourself," where you can write whatever you want in the comments. You can describe yourself, what you do and post your links. Are you a consultant with a website to promote? Do you work at a small company, large company? I'm interested in who's reading this blog and saw this idea on a different blog. I thought it might be an interesting experiment. So head over and let me know who you are! 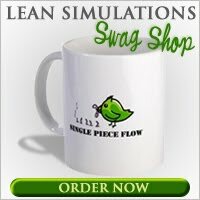 Huge List of Free Lean Games! Equally Massive List of Free Lean Videos! The owner of this website is a participant in the Amazon Services LLC Associates Program, an affiliate advertising program designed to provide a means for sites to earn advertising fees by advertising and linking leansimulations.org to Amazon properties including, but not limited to, amazon.com, endless.com, myhabit.com, smallparts.com, or amazonwireless.com.